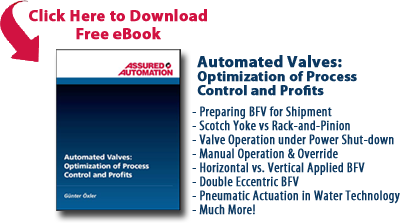 Assured Automation: your source for manual and automated valves and flow meters. Today we’re going to review the wiring for the V4 Series 12 or 24 Volt DC Electric Actuator. 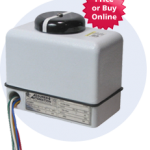 The V4 is a reversing motor electric actuator with end of limit travel switches to stop the motor in each direction. The V4 Series comes with external wire leads for ease of wiring. The housing cover never needs to be removed. Apply your positive DC Volts to the blue wire, number three (3), and the negative DC Volts to the white wire, number four (4), for counter-clockwise rotation. When the DC power is applied to number three (3) and number four (4), the actuator will turn counter-clockwise until it reaches the internal limit switch and shuts off. Apply positive DC Volts to the red wire number one (1) and negative DC Volts to the black wire number two (2) for clockwise rotation. When power is applied to number one (1) and number two (2), the actuator will turn clockwise until it reaches the internal limit switch and shuts off. Optional feedback switches are available and are operated off two additional cams, which will confirm your open and closed travel positions. See the V4 Series Electric Actuator Wiring Diagram for more information. To engage the Manual Override, remove the indicator cap, put a wrench on the nut, and turn to the desired position. This entry was posted in Installation and Training, Latest News and tagged drive electric actuator, Electric Actuator, electric actuator DC, electric valve actuator, wiring an electric actuator. Bookmark the permalink.